The Carb-Sane Asylum: The Myth of Starving Cells II and NEFA Levels Again. The Myth of Starving Cells II and NEFA Levels Again. Related Post: Insulin Doing Its Thang! And Still No Starving Cells. It discusses another study by Keith Frayn that shows increased NEFA uptake into the muscle cells of men with hyperinsulinemia. It may be worth a read for newer readers along with The Myth of Starving Cells. A couple of years ago I wrote: The Myth of Starving Cells. As the story goes --as related by science journalist Gary Taubes, to Low Carb Diet Doctor Mike Eades, to Fat Head Naughton -- insulin traps our fat in our fat cells, causing "internal starvation" as the rest of our cells go without, triggering hunger and overeating. We overeat because we are getting fat, or some nonsense like that. In the post, I discussed studies demonstrating the opposite is true. In obesity, there is failure to properly suppress NEFA release from fat cells, NEFA are elevated in the fasted state, and irrespective of absolute concentration, NEFA delivery to cells. This increased uptake by the cells results in accumulation of fat within ectopic cells, such as muscle cells (called intramyocellular triglyceride or lipid, IMTG, IMCT or IMCL). The cells have plenty of fat fuel to burn ... indeed this is a problem! So I was looking for a link to that Ebbeling et.al. study the other day -- this one: Effects of Dietary Composition on Energy Expenditure During Weight-Loss Maintenance. In the study, a group of obese people were put on a relatively high protein (25%), relatively low fat (30%) and moderate carb (45%) diet and lost between 10 and 15% of their initial body weight. After which they were weight stabilized and then fed one of three maintenance diets for 4 weeks in randomized cross-over fashion. These diets were P/F/C: low fat = 20/20/60 , low GI = 20/40/40, and low carb = 30/60/10. 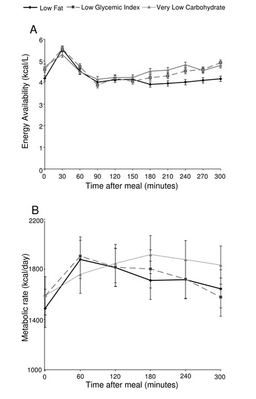 Effects of Diet Composition on Postprandial Energy Availability during Weight Loss Maintenance. Background: The major circulating metabolic fuels regulate hunger, and each is affected by dietary composition. An integrated measure of postprandial energy availability from circulating metabolic fuels may help inform dietary recommendations for weight maintenance after weight loss. Methods: Eight obese young adults were fed a standard hypocaloric diet to produce 10–15% weight loss. They were then provided isocaloric LF, LGI, and VLC diets in a randomized crossover design, each for a 4-week period of weight loss maintenance. ***At the end of each dietary period, a test meal representing the respective diet was provided, and blood samples were obtained every 30 minutes for 5 hours. The primary outcome was EA, defined as the combined energy density (circulating level×relative energy content) of glucose, free fatty acids, and β-hydroxybutyrate. Secondary outcomes were individual metabolic fuels, metabolic rate, insulin, glucagon, cortisol, epinephrine, and hunger ratings. Respiratory quotient was a process measure. Data were analyzed by repeated-measures analysis of variance, with outcomes compared in the early (30 to 150 min) and late (180 to 300 min) postprandial periods. Results: EA did not differ between the test meals during the early postprandial period (p = 0.99). 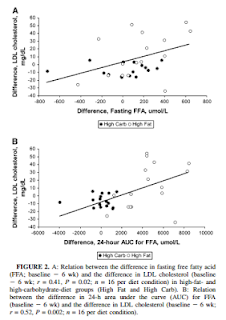 However, EA in the late postprandial period was significantly lower after the LF test meal than the LGI (p < 0.0001) and VLC (p < 0.0001) test meals. Metabolic rate also differed in the late postprandial period (p = 0.0074), with higher values on the VLC than LF (p = 0.0064) and LGI (p = 0.0066) diets. Conclusion: These findings suggest that an LF diet may adversely affect postprandial EA and risk for weight regain during weight loss maintenance. The *** indicates the new part of this protocol. The test meals were all 500 cals. So here are the metabolic substrate, hormone and hunger levels for the three diets. They also calculated circulating energy availability (EA) combined for glucose, NEFA and ketones and measured metabolic rate. 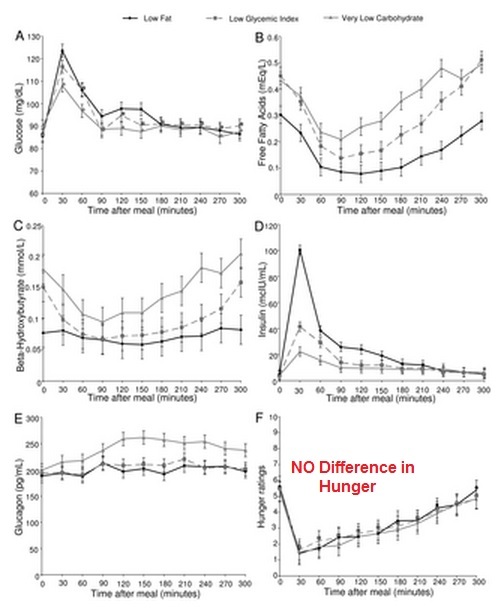 As stated in the paper, there is no difference in this EA in the early postprandial period, but the low GI and low carb diets both appear to provide more circulating substrates in the late -- 3-5 hours -- postprandial phase. Let's look at the metabolic rate first -- it is not surprising to me that the carbs in the LGI and LF diets elicit an early "spike" from thermogenesis, falling off. That LGI and LF both fall off somewhat similarly demonstrates the low thermogenic effect of fat. Meanwhile the fat in the LC diet appears to delay protein consumption and the rise in metabolic rate reflects thermogenic protein. The low carbers are also likely to point out that they were right! See? Right there, the LF (high carb) diet is locking away nutrients!! The cells are starving .... Not really. If we use about 5 L as the total blood volume, the first thing I note is how remarkably low all of our energy availability is. We're talking between 21 and 23.25 Calories here! The low carbers had just over 2 additional calories in their circulation. I'm shaking my head here that this differential is even being analyzed and reported!! But let's go back to the Background and Conclusion, between which I've summarized the results. Background: The major circulating metabolic fuels regulate hunger and each is affected by dietary composition. Conclusions: ... an LF diet may adversely affect postprandial EA and risk for weight regain during weight loss maintenance. How? This study lent zero support for that conclusion. Hunger was independent of total EA, or the differing levels of either glucose, NEFA or ketones. This study does NOT support any sort of scenario of starving cells. The opposite really, because it demonstrated nominal differences in EA despite seemingly larger differences in specific energy substrates. This would indicate that the circulating EA is above (likely significantly above) our basic energy needs (an instantaneous picture of the circulating levels also tells only part of the story as uptake and production rates are really more important). Yes, the high carb low fat diet "locked" more energy away. But clearly this was not starving out the other cells and leading to hunger. 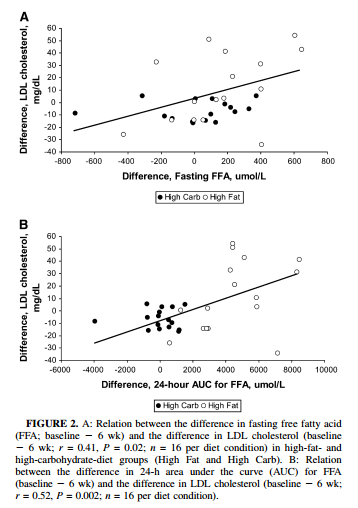 Now, the other reason the graphs in this study caught my eye was that they showed postprandial NEFA levels for a truly LC meal (10% of 500 cal = 12.5g) in a weight maintaining context. Previously, I had blogged on this study: Lack of suppression of circulating free fatty acids and hypercholesterolemia during weight loss on a high-fat, low-carbohydrate diet (Hernandez). The graph at right shows insulin and NEFA vs. baseline (usual diet). Clearly the insulin has the effect of suppressing fatty acids in the postprandial state. This was a weight loss study, however, so one would expect fatty acids to be elevated as fats are liberated from storage. Now, the low carb "science" relies on this suppression being a "bad thing", when indeed it is not. They would be happy to convince you that your "fat burning" is barely impacted by the low carb meal! In a hypocaloric state this may not be a bad thing ... but what of the eu-or-isocaloric state? That's what this current study showed. The two high fat diets (low GI was 40% fat) had similar impacts on NEFA -- it is elevated -- and the low GI diet results are potentially troubling as this diet was 40% carb (hardly LC in the context of 2600 cal/day on average = 260g/day, and of the 500 cal meal = 50g carb = not huge but elicits an insulin response). In the Hernandez study, the fasting NEFA is correlated highly with LDL -- This is a correlation seen in a few studies now. Thus if you see your LDL go up on a LC diet, there's a good chance that your NEFA are elevated. If you think that's a good thing, congratulations, but especially once you've reached a stable weight, there's no study I've ever come across equating higher fasting NEFA levels with better health. All uncontrolled diabetics have elevated fasting NEFA, most obese do. When things go awry, the appropriate NEFA suppression in the postprandial state seems to be the first to go. The elevated NEFA will increase lipid in the ectopic (non-adipose) tissues altering cellular metabolism and likely impairing glucose oxidation. They will also stimulate basal insulin and impair beta-cell function in the postprandial state, or at least the potential is there. There really haven't been any long term studies on VLC to know, but anecdotal reports of worsening glucose handling over time -- even for those who were not insulin resistant to begin with -- would seem to be cause for consideration/concern. 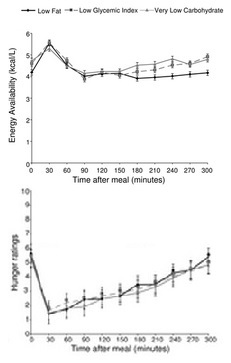 Increased postprandial "Energy Availability" in the circulating form does not seem to be a regulator of hunger as proposed in the first study. And it does not appear to be a desired metabolic state unless one is running from a lion! just your articles? I mean, what you say is fundamental and all. hi. I've added a comment with a link in again. Just informing you, so you can veto the post. a distance and bring their body to you, avoieing potential problems. New Diet Taps into Revolutionary Idea to Help Dieters Lose 20 Pounds in Only 21 Days!